We require a credit card number to secure the group reservation. Please be sure to include your Guest Type (required by Domaine Carneros). Newsletter: By selecting any of the following options, you agree to receive communications from Domaine Carneros. We do not share your information with any 3rd parties. You can withdraw your consent at any time. Stay personally connected to Domaine Carneros with your free preferences profile. You'll have convenient access to Domaine Carneros's news, promos and special events! And Domaine Carneros can get to know you better with automated communication. Drink in spectacular lake and vineyard views from your private table on the terrace or in the salon. You'll taste handcrafted sparkling and still wines, and savor local artisanal cheeses and other indulgences paired to your wines. You may browse for wine, accessories, chocolates and gifts. We are one of the few wineries where you can relax and enjoy table service in the elegant salon or on the terrace overlooking exquisite views of the endless vineyard-covered hills of romantic Napa Valley. Wines may be tasted in flights or by the glass. Caviar and artisan cheese plates matched to our wines are also available.Reservations can be booked up to 4:45 pm on the day prior to your arrival. 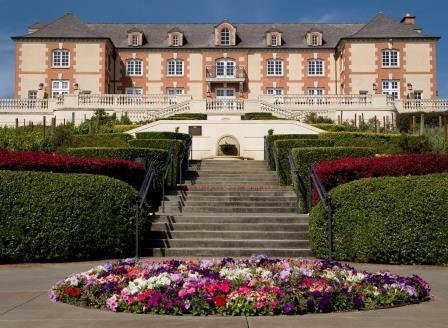 Situated at the base of Napa Valley and Sonoma, Domaine Carneros is renowned for award-winning, organic, estate sparkling wine and Pinot Noir. 1240 Duhig Road,Napa, CA, 94559 Domaine Carneros is accessed via Duhig Road, just off the Carneros Highway (12/121) four miles from the town of Napa and five miles from the town of Sonoma. 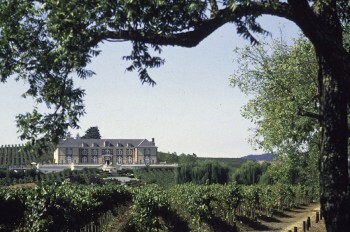 The chateau is 50 miles from San Francisco's Golden Gate.